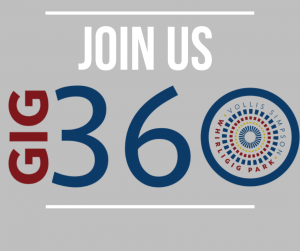 Gig360 is a social organization for community-minded young professionals who are dedicated to sustaining the Whirligig Park, networking with peers, and growing a culture of young living in Wilson County. Gig360 is a social organization for young, community-minded professionals in and around Wilson, NC. The Vollis Simpson Whirligig Park Gig360 Young Professionals group will organize monthly pop-up socials, networking gatherings, and special events. Gig360 will also act as an integral advisory body to the Vollis Simpson Whirligig Park non-profit board. The group’s core membership focus is 21-45, but we welcome anyone who would like to join! The Gig360 group is dedicated to supporting the Vollis Simpson Whirligig Park & Museum because it is a community asset and an integral part of our community’s identity. Contrary to popular belief, the Vollis Simpson Whirligig Park non-profit does not receive guaranteed funding from any public sources. Without a definite source of revenue to support park operations such as insurance, maintenance, and marketing materials, Gig360 members believe it is their responsibility to do their part in helping to ensure the whirligigs keep spinning through fundraising. A Gig360 member will receive special incentives such as discounted park rental rates, a charitable donation letter, a Gig360 decal, invitation to all Gig360 networking events, discounted ticket price for all VSWPM & Gig360 events, a t-shirt, etc. The inaugural Gig360 class has a special membership incentive, their name featured on a sponsorship plaque on a whirligig in the Vollis Simpson Whirligig Park. $180 pledge… full membership with an expectation you will volunteer at least 10 hours per year with the VSWPM organization and/or the Gig360 group. $360 pledge… full membership without a minimum volunteer expectation. Want to learn a little more about Gig 360? Follow us on Facebook and attend one of our networking events!